It is hard to resist making a one pot meal when you come across one. Not only does it help you significantly when it comes time to clean up (which is especially important when you are having one of those hectic weeknights) but it also gives you a great chance to really meld some flavors of your protein, starch and vegetables all in one so that everything tastes great. One pot meals work well with anything – beef, chicken, fish, vegetables – but I find they work really well with pork chops. Pork chops on their own need some seasoning and flavor to really make them explode, and when you combine them with a great sauce, some vegetables and a starch you can get a great meal without it having to take a long time to cook. this recipe, from Cook’s Country, is the perfect example of that, making a simple skillet pork chops and rice. Combine 2 tablespoons of the butter and the parsley together in a small bowl; reserve. Microwave 1 cup of the chicken broth and the rice in a covered large bowl until the liquid is absorbed, about 6 to 8 minutes. Meanwhile, pat the pork chops dry with paper towels and season them with salt and pepper. Melt 1 tablespoon of the butter in a large skillet set over medium-high heat. Brown the pork chops, about 3 to 4 minutes per side. Transfer the pork chops to a plate and tent them loosely with aluminum foil. Melt the remaining 1 tablespoon of butter on the now-empty skillet over medium-high heat. Cook the onion until it is softened and browned, about 6 to 8 minutes. Add the garlic and the dried thyme and cook until they are fragrant, about 30 seconds. Stir in the parcooked rice and the remaining 11/4 cups of chicken broth and bring the mixture to a boil. Return the pork chops and any accumulated juices to the skillet and cook, covered, over medium-low heat until the pork chops register 145 degrees on an instant-read thermometer inserted into the thickest part of the chop and the rice is tender, about 12 to 15 minutes. Serve the pork with the reserved parsley butter. It is very simple and gives you juicy and tender pork chops along with great tasting rice. 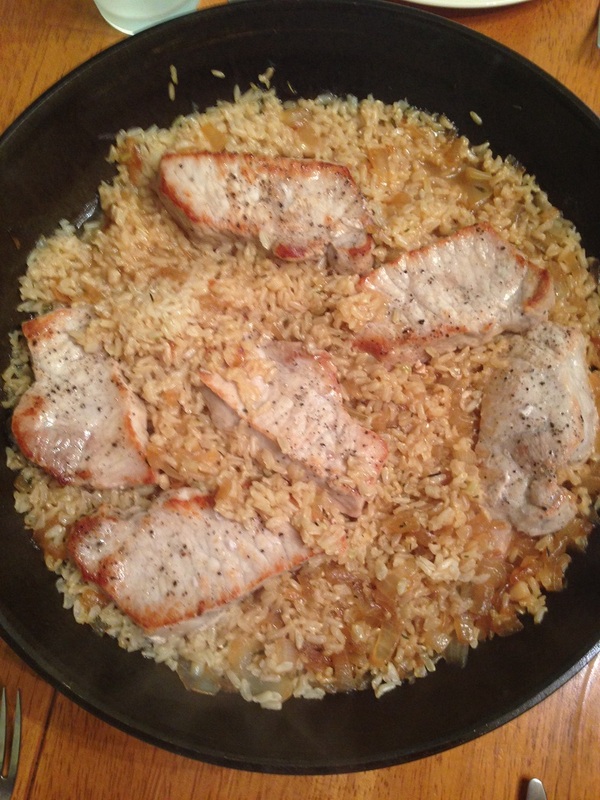 This recipe uses white rice, but I actually made some brown rice, using this method to cook it and taking it out of the oven 45 minutes into cooking, when the brown rice was mostly done, and the adding it to the skillet with the pork chops to finish up the dish. I thought it turned out really well, but you could use whatever type of rice or grain that you really like. Getting the rice started in the microwave is a great way to save yourself some cooking time to make sure everything is done all at once. This is the perfect meal for a weeknight dinner when you want something that tastes great but does not take a long time to put together, prepare and cook. I love a good one pot meal. I am going to give this a try. Thanks for sharing. It’s a good one – easy and great tasting. Thanks for the comment!